The Civil War Muse - Francis P. Blair, Jr.
Born in Kentucky, Francis P. Blair, Jr. was a Representative in the United States house of Representatives from the State of Missouri at the beginning of the American civil War. In 1861, Frank Blair raised the First Missouri Volunteer Infantry Regiment to help defend the state against Missouri secessionists. 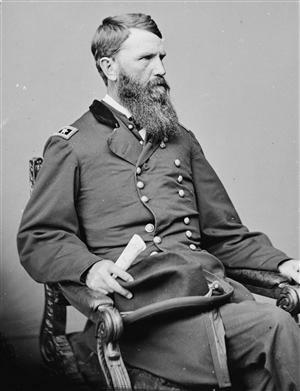 Frank Blair rose to the rank of Major General of Volunteers and would command divisions in the armies of Major Generals Ulysses S. Grant and William T. Sherman. After the war, Blair was the Democratic candidate for Vice President of the United States running on the ticket of presidential candidate Horatio Seymour. In 1871, Blair was elected to represent Missouri in the United States Senate where he served until his death in 1872.